THIS IMAGE IS LICENSED TO FACTA FOR PR AND COMMUNICATION USE AND DISTRIBUTION TO THE MEDIA WHO MAY USE THE IMAGE FREE OF CHARGE IN CONNECTION WITH THE RELEVANT STORY ONLY. Cogan Primary School, Barry. © Roger Donovan, Mediaphotos 02920 361126 07711325100 roger@mediaphotos.co.uk www.mediaphotos.co.uk All moral rights reserved, including the right to be identified as the creator of this copyright protected image. 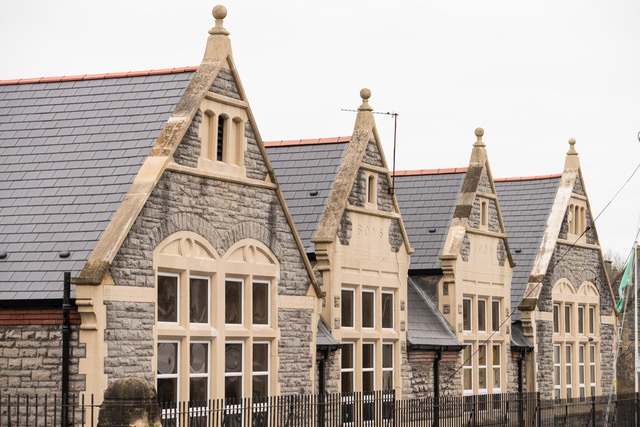 Sympathetic locally-sourced materials, technical expertise and guarantees led Vale of Glamorgan Council to choose BMI Redland and BMI Icopal materials when re-roofing an early 20th century primary school. Built in 1905, Cogan Primary School suffered from a roof that continually leaked despite being patched with various types of slate over the years. The roof’s deterioration was accelerated by thieves stripping lead flashings and it had the complexity of there being a 100m2 flat roof right in the centre of the school. For the pitched roof the solution was BMI Redland Cambrian Slate, an interlocking slate manufactured from recycled waste slate in nearby Merthyr Tydfil, a dry-fix system to cut down maintenance, and fixings on the ridge and hip system to mimic the previous roof. In addition, standard eaves vents could not be used because there was lath, plaster, and tar between the rafters at eaves level. Installing eaves vents would have damaged the vaulted ceiling, so vent tiles were used for venting instead. For the flat roof, BMI’s Area Technical Manager specified BMI Icopal’s Firesmart SBS modified reinforced bitumen membranes, accredited by the Loss Prevention Certification Board (LPCB).